The Dirt Doctor's latest fence design and the new canby oak being planted. Here's my latest wild fence design at home. It is the back side of a board fence with steel posts. 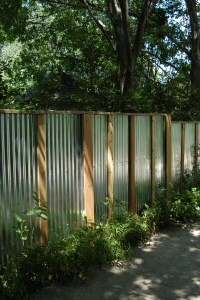 Standard pre-cut corrugated tin panels are separated by rough cut cedar. I may paint the panels later and I may just stain the cedar a darker color. On the other hand, it may stay just the way it is. I kinda like it. 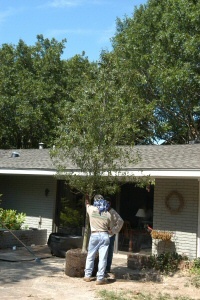 The canby oak is a semi-evergreen redoak that does well (at least) from San Antonio to Dallas.